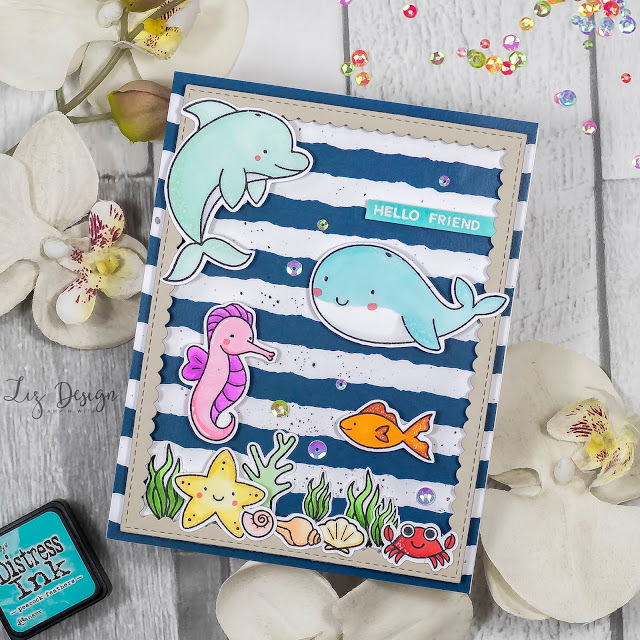 Stampin with Liz Design: Beach Buds Card! Hi everyone! Welcome to a new Blog Post! As you probably all know, I love entering a good challenge! I have a few challenges that are my favorites, the Mft Challenges are sure one of them! 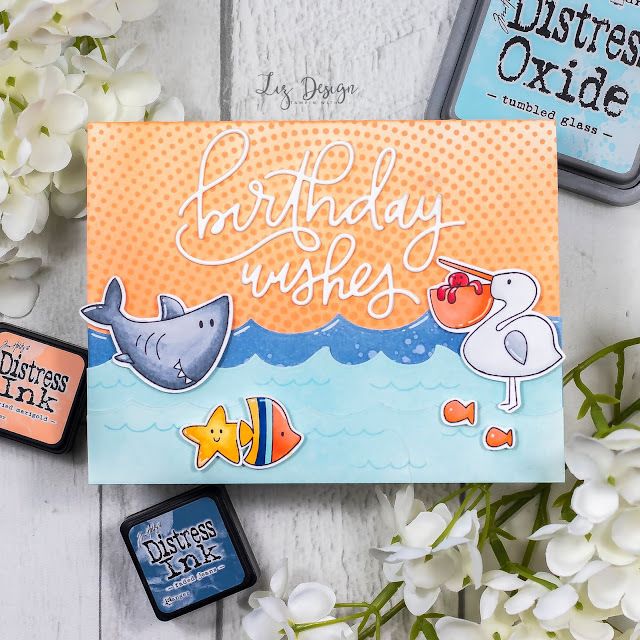 I created this card for their color challenge that is up this week! For this card is was all about the color scheme. I usually start with the colours in mind and then add a stamp set that could be fun! 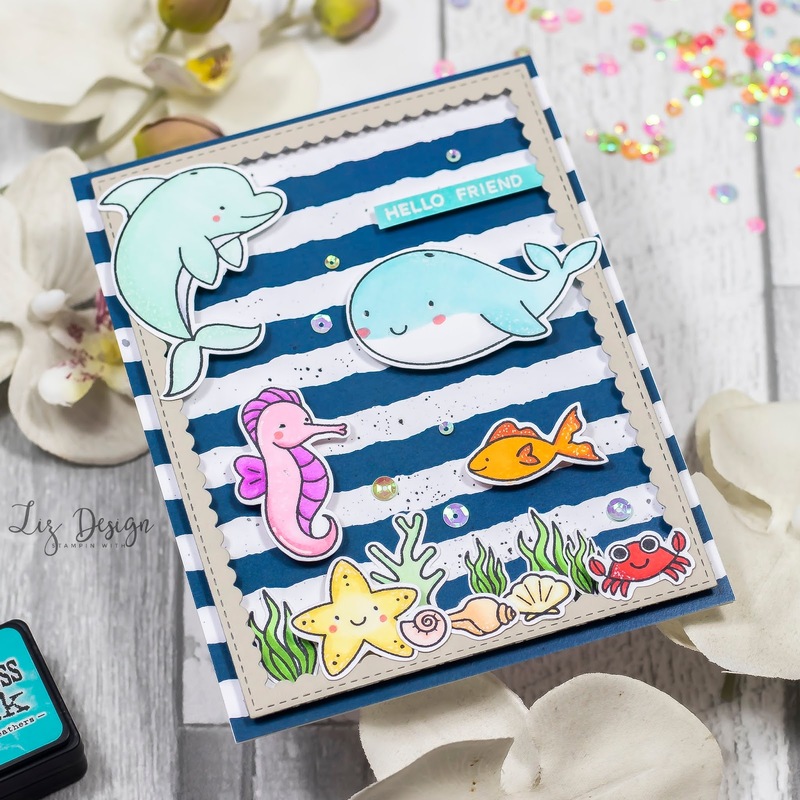 For my card for today I picked the fun stamp set Beach Buds from MY Favorite Things. 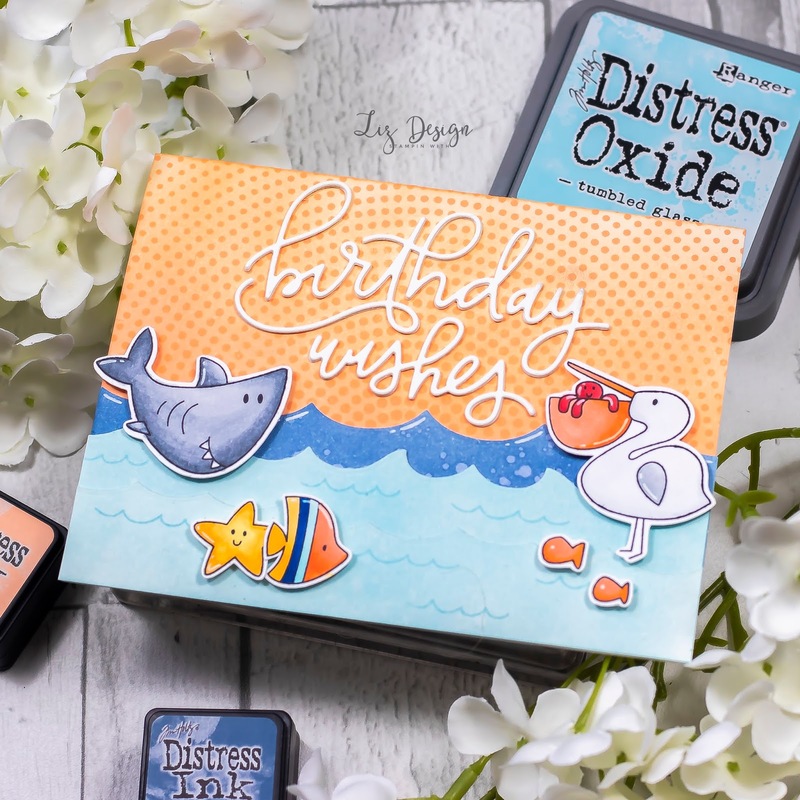 A stamp set full beach fun! I started by blending a background on my white A2 sized base with Dried Marigold Distress ink from Ranger. I then added some fun detailed dots using the same ink and the background stamp Radiating Halftone Background from My Favorite Things. I adhered the text Birthday Wishes to my card, which I diecutted with the Birthday Wishes Dies from My Favorite Things as well. For the front I diecutted a few pieces of white cardstock with the Ocean Waves dies and blended these with Faded Jeans and Tumbled Glass Distress ink. I stamped and diecutted the images, which I coloured with Copic Markers and added to my card with dimensionals. A lot of beach fun! Stampin with Liz Design: Puddle Jumper Card! Hi everyone! I'm a bit last minute this week, but I created another entry for the Mft sketch challenge! 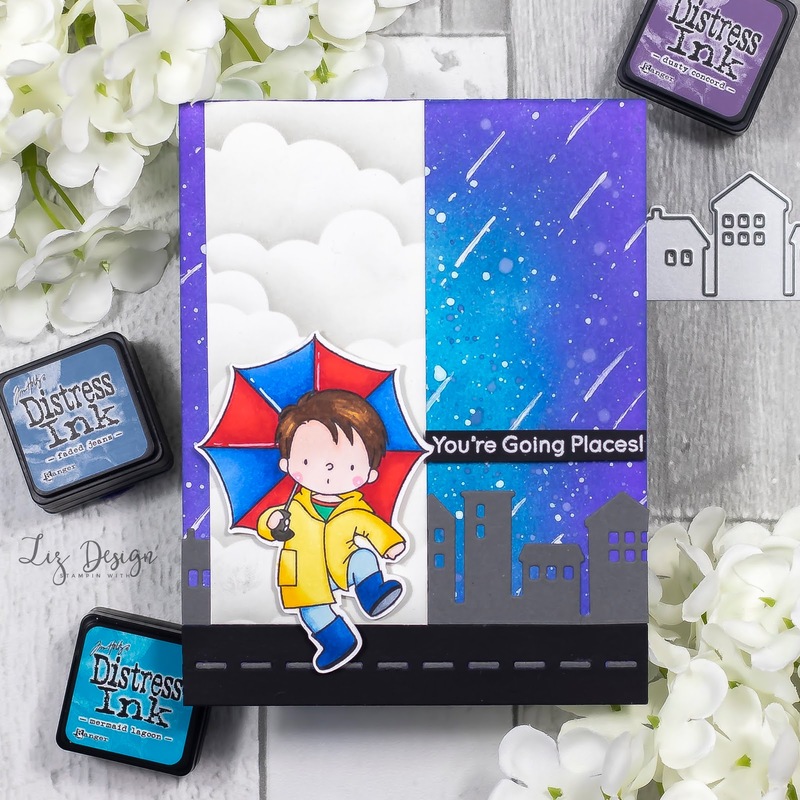 With the challenge in mind I picked the fun stamp set Puddle Jumper from Mft stamps. I just love this cute little stamp set, the boy is so adorable! I started my card by creating the background on my card base first. I used an A2 size card base in thick white cardstock. I blended my background with three colours Distress ink from Ranger, Dusty Concord ad the sides and Faded Jeans and Peacock Feathers for the middle part. To make the background more alive, I added some spatters in Faded Jeans and white paint. I also added some rain by using a white gel pen. I then started working on a scene for this card. 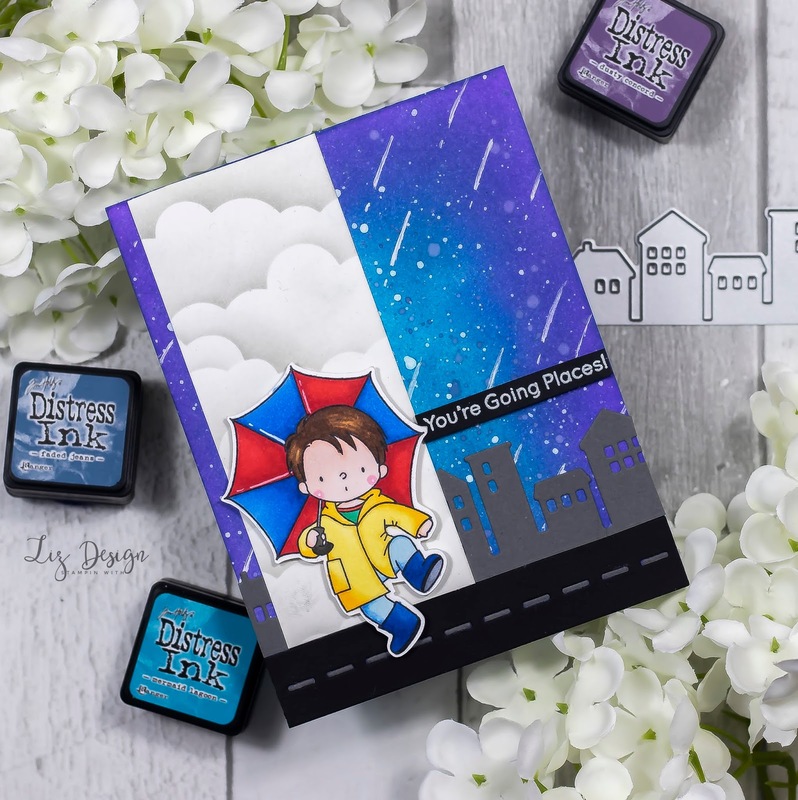 I diecutted the street with the Open Road Die from Mft in black cardstock and a skyline from dark grey cardstcok by using the Our Town Die-namics from Mft with all the cute houses. 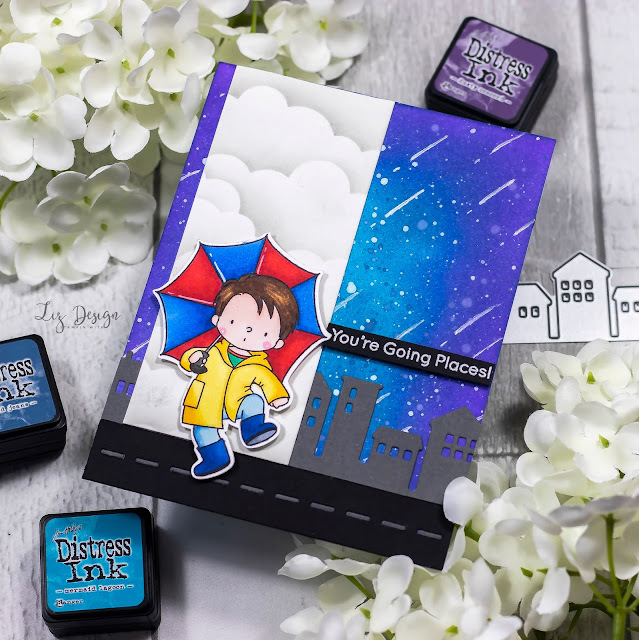 I added a stroke of white cardstock with clouds, which I created by using a blending tool, Smoky Slate ink from Stampin' Up and the Cloud Stencil from Mft stamps. Then I added my image, this boy is just so cute! I stamped and diecutted the image and then coloured him with Copic Markers. I used dimensionals to attach him to my card base. I then stamped the text You're Going Places, which comes from the stamp set Up in the Air from Mft stamps, on black cardstock with Versamark ink and used white embossingpowder. When you heat set the text it get's a nice layered texture. I added the text with dimensionals as well to finish this fun card! Stampin with Liz Design: Birthday Bus Card! Hi everyone! We just recently bought a bus camper, a bit of nostalgie for us, when my husband and I first got together, we had an old Volkswagen camper. This one is a bit more recent, but still brings back that fun nostalgic feeling. 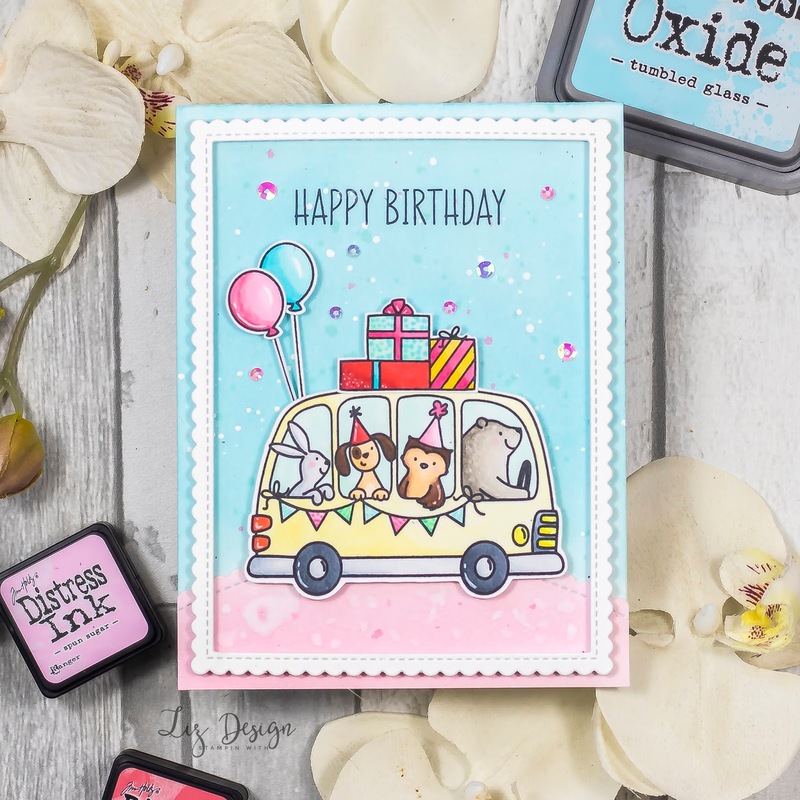 So when I saw the Birthday Bus stamp set from Avery Elle, I had to order last week! For this card I blended my A2 sized white card with Tumbled Glass Distress Oxide ink from Ranger. I added some spatters in the same colour blue, pink and white. I then diecutted a bottom piece from White cardstock with a die from the Stitched Scallop Basic Edges Die-namics from My Favorite Things. I blended this piece with Sugar Spun Distress ink and added some pink ink spatters and water drops to idd. I added text in the upper middle, which is from the set as well. In front of my base, I created a panel with the largest die from the Stitched Rectangle Scallop Edge Frames Die-namics from My Favorite Things. I placed this on to my base by using foam adhesive strips, so it is a bit lifted. Then I stamped the fun bus image with the cool party critters on Solar White Neenah Cardstock. I coloured them with Copic Markers. After colouring, I diecutted the images with my Scan 'N Cut machine from Brother, but there are coordinating dies available! I added them to my card with dimensionals. To finish this fun and bright card I added some sequins! 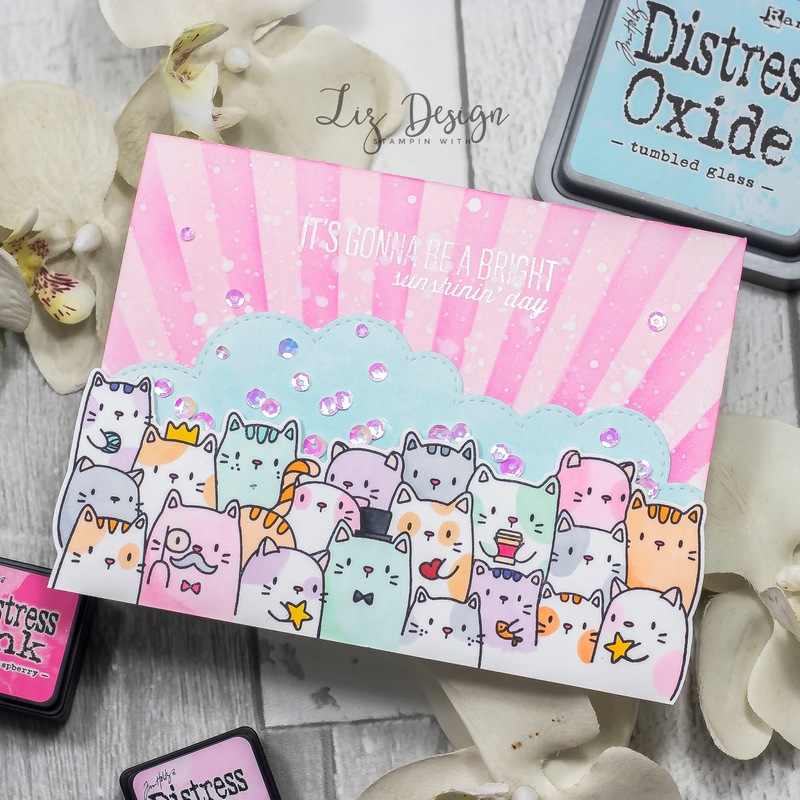 Stampin with Liz Design: The Cat's Meow Card! Hi everyone! Welcome to a catty blog post today! I love everything furry, although we own a lot of animals, we don't own cats. We live next to a busy road, so I'm not even gonna go there, lol, but stamping cats we can do! For my card today I used the fun stamp set The Cat's Meow from Mama Elephant stamps. These cats are so much fun! I created a pink background, by blending my card with Spun Sugar and Picked Raspberry Distress ink from Ranger. 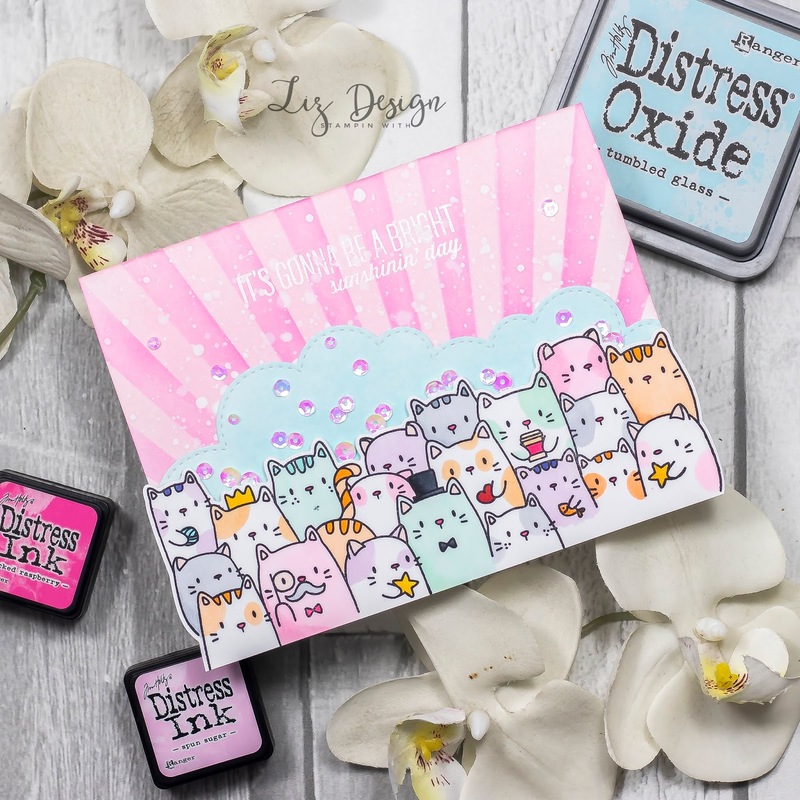 I love using the mini ink pads, you can store them in cute tins. They come in many fun colours. I added the rays by using the Ray of Light stencil from My Favorite Things. To give the background a bit extra, I added spatters of white ink and water. I then diecutted a piece of white cardstock with the Stitched Cloud Edges Die-namics from My Favorite Things. I then blended this piece of cardstock with Tumbled Glas Oxide ink from Ranger. To bling this card up I added loads os sequens! Use a fin tip glue pen to adhere these small embellishments, just a small drop of glue will hold them. I stamped the sting of cats on Solar White Neenah Cardstock and diecutted them with the coordinating dies. I coloured the cats in soft colours and adhered them on to my card using dimensionals. To finish my card, I added a tekst, which comes from the stamp set Carried Away from Mama Elephant. Just meow I think, lol, a whole lot of fun on one card! Stampin with Liz Design: Sea Friends Card! Hi everyone! Welcome to a new blog post today! Just a few weeks ago we visited Sea Life, our kids love their fish tanks, so I thought it would be really fun for them to visit Sea Life. 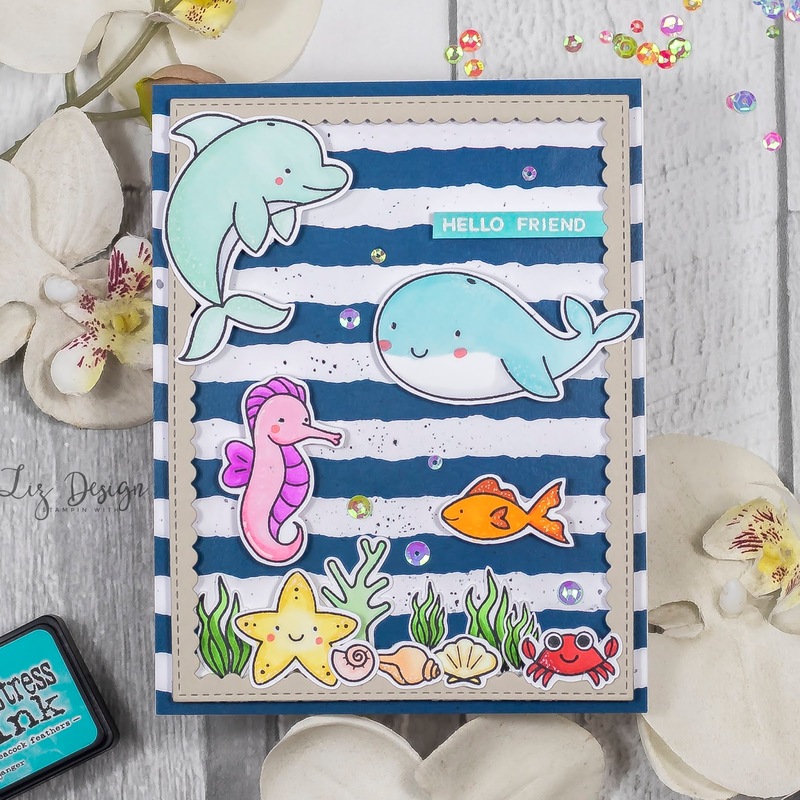 When I saw the stamp set Sea Friends from Pretty Pink Posh, I just couldn't resist! I'm really enjoying all the new brands for me, got to say I love this brand, can't wait to order more! Don't you just love these friendly sea creatures? I'm so in love with them! I started this card with a white card base from thick cardstock in A2 size. I added a blue and white striped design paper from the Sugar & Spice Paper Pad from SugarPea Designs. The paper from this pad is already in A2 size, love it! A perfect match! Although I love this paper already, I was stubborn enough to add some spatters to it with black ink. Lol, can't denie it, I do love spatters! I then added a panel created with the largest die from the Stitched Rectangles Scalloped Frames Die-namics from My Favorite Things. 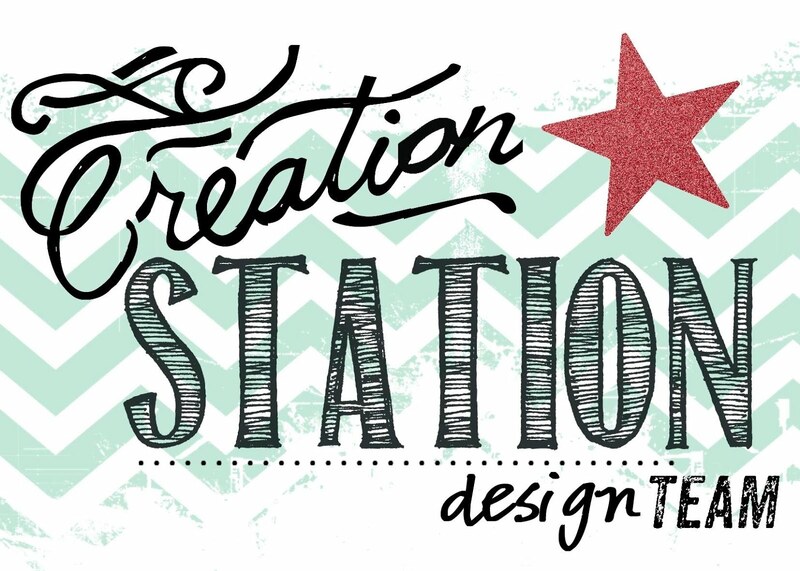 I diecutted this from Sahara Sand Cardstock from Stampin' Up. I lifted this panel from my card base by using Foam Adhesive Strips. I stamped and diecutted (using my Brother Scan 'N Cut machine, but of course there are coordinating framelits for this set you can use) the sea images. I love stamping on Solar White Neenah Cardstock. For me this is my favorite paper to color with Copic Markers on. After colouring them, I added them with dimensionals on to my card, except for the sea plants, they are added with double sided adhesive tape right on my front. I added a tekst using a piece of white cardstcok that I blended with Peacock Feathers Distress ink from Ranger. To give this card a bit extra, I added some sequins to it! 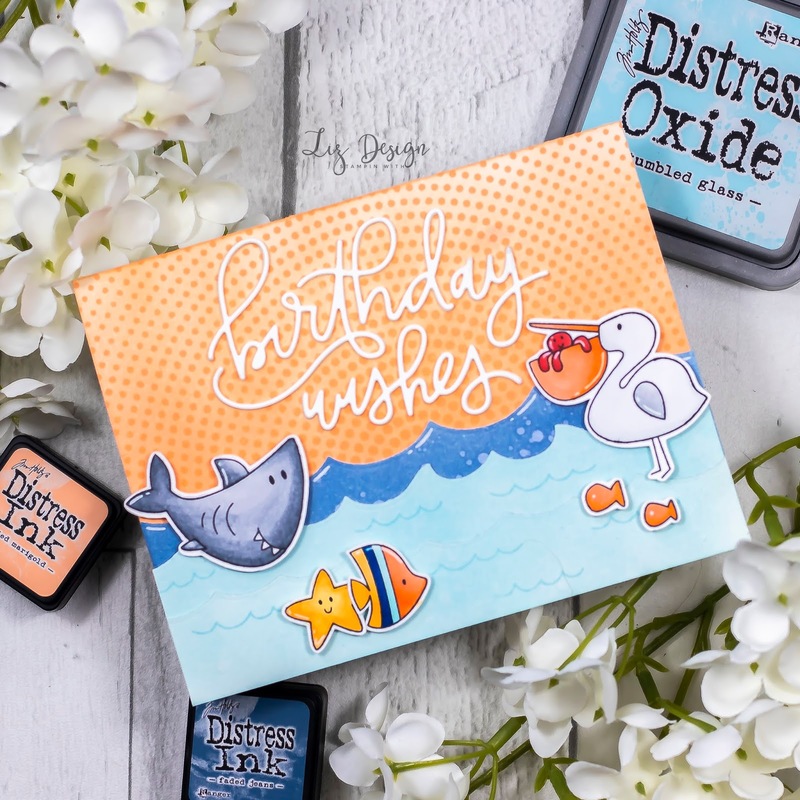 Stampin with Liz Design: Perfectly Paired Card! 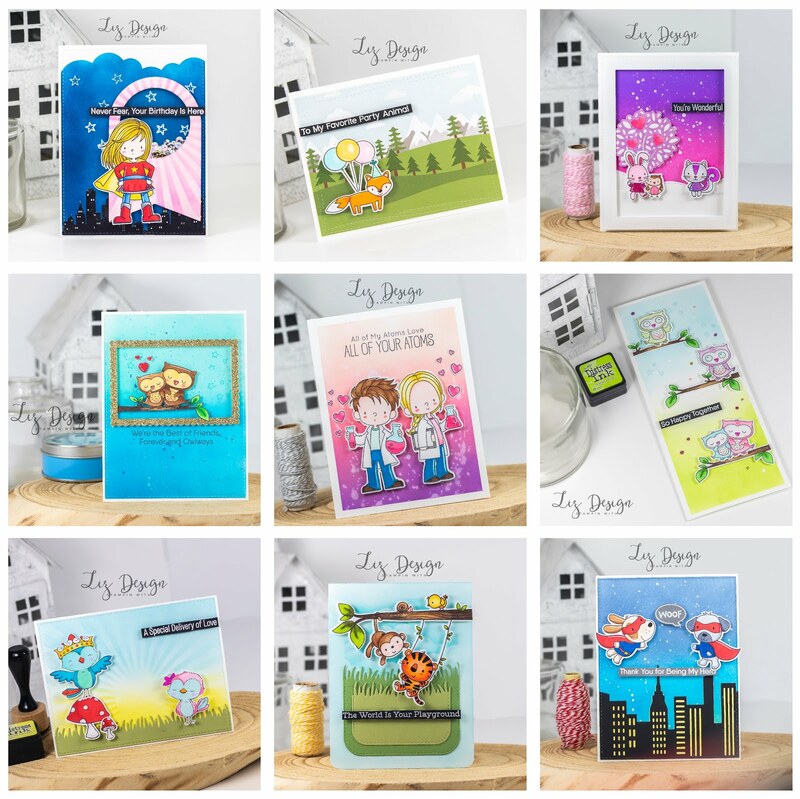 Stampin with Liz Design: You Gnome Me Card! 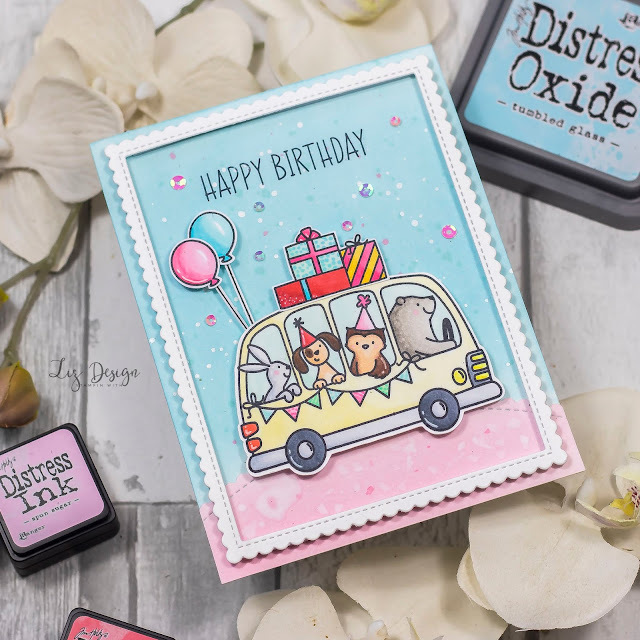 Stampin with Liz Design: Birthday Monkeys Card! 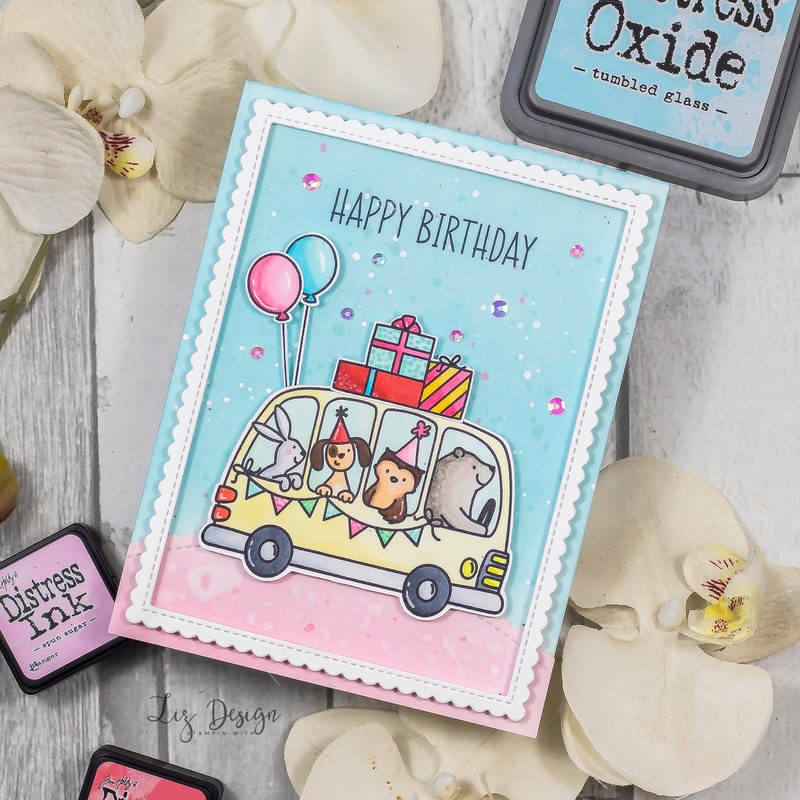 Stampin with Liz Design: Happy Birthday Blend! 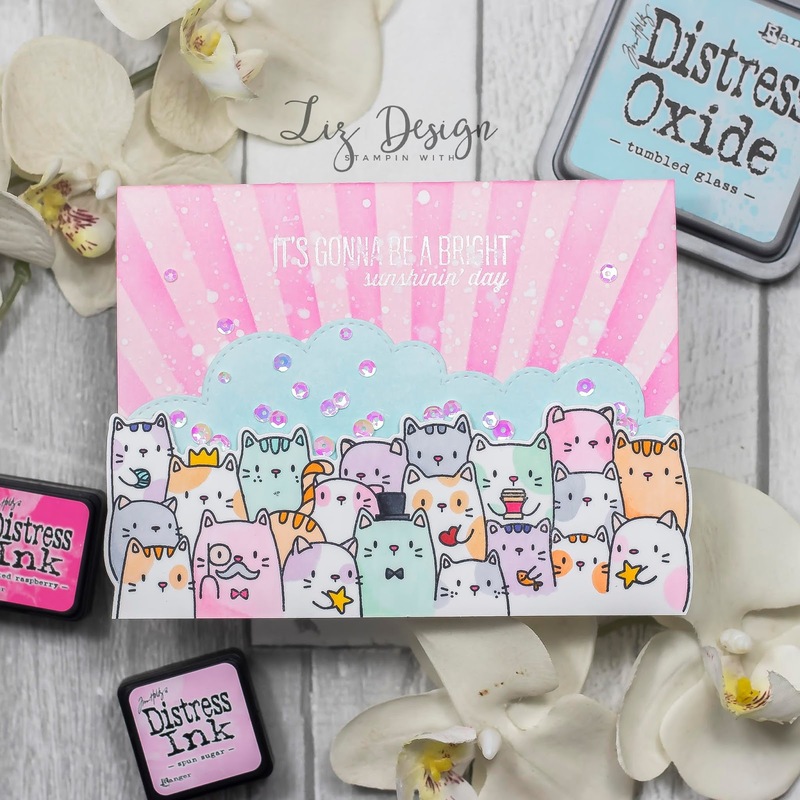 Stampin with Liz Design: Up in the Air Card!